The Bouquet of Majesty tapestry shows an elegant display of flowers on a vase. Perched on a stone bench, we see tulips, roses and peonies in bloom, and arranged in a beautiful formation. Some petals and flowers are falling onto the ledge below. The dark background accentuates the soft and light colored blooms most effectively. An elaborate golden border completes the work. 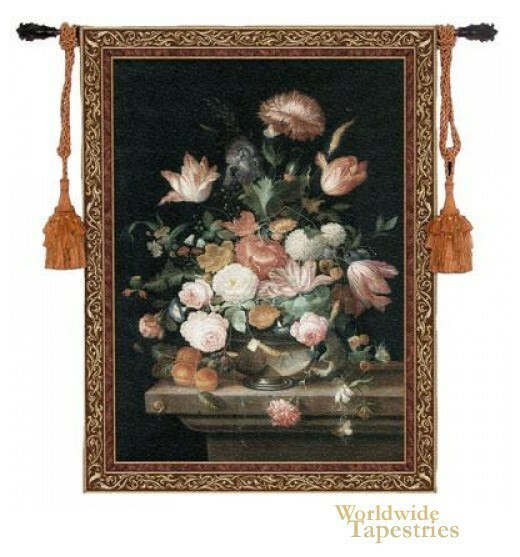 This Bouquet of Majesty tapestry is backed with lining and tunnel for easy hanging. Note: tapestry rod and tassels, where pictured, are not included in the price.